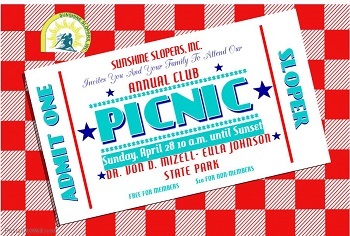 Join your fellow Sunshine Sloper Family and Friends for a day of sand, sun, and fun. DIRECTIONS: TAKE 1-95 TO DANIA BEACH BLVD. GO EAST ON DANIA BEACH BLVD. TOWARDS THE BEACH STAY IN THE RIGHT LANE. ONCE OVER THE INTER COSTAL BRIDGE, TAKE THE SECOND RIGHT TO JOHNSON BEACH. SIGNS WILL DIRECT YOU. THE TOLL BOTH IS ABOUT 1/4 MILE DOWN THE ROAD. We are asking all attendees to bring a dish to share. Meats will be provided by the club. There is a $10 charge for non-members. Please RSVP to Delores Flowers 305 812 7833 no later than Wednesday April 24, 2019. We want to make sure there is plenty for all. Parking is just steps away from the Pavilion which is totally shaded. The beach is also just steps away from the Pavilion. If you were at the picnic last year, you know how much fun we had! This year it is going to be even more Fun.